The near absence of any effective policing in the northeastern Democratic Republic of Congo (DRC) district of Ituri, Orientale Province, is fuelling mob violence which has seen about 100 people killed and 1,500 houses torched in the past year, according to local civil society groups. People are killed in Ituri after petty disputes or on mere suspicion of practising sorcery, Samuel Jakwong'a, a spokesperson of civil society groups in Mahagi Territory, told IRIN. Revenge attacks are also common, leading to a vicious circle of violence where innocent victims, especially women and children, are affected, according to local human rights NGO LIPADHO. “When we find a corpse close to a village, there will be revenge [attacks] from the dead person’s family. This brings about a cycle of violence with houses being burnt down in the suspect’s village,” explained Jakwong'a. Personal disagreements in Mahagi easily degenerate into inter-communal clashes, said Joachim Unegi, a human rights activist. He told IRIN of a case in February where a row between a headmaster and one of his students in Angal Chiefdom (the most populous of eight chiefdoms in Mahagi Territory) had led to clashes between the two families, leading to the burning down of dozens of houses. The insecurity has left families homeless and vulnerable. Jacqueline Uyera, 60, is a farmer and a petty trader. Her house was burnt down, alongside 71 others, in a February attack in the village of Mungere, 180km south of Ituri’s main town of Bunia, after a corpse was discovered there. Children were not spared in the attack. “At the time [of the attack], my husband and I had gone mourning. Unfortunately, a large portion of my money and other property was burnt down in the house - clothes, blankets, maize, beans, cassava, everything. Even if you were present you would not have saved anything. They [the attackers] were very many, in three different groups. Uyera, whose goats and pigs were also looted, told IRIN that her family, including the orphans she supports, are now going hungry. “We have done nothing wrong, besides we are not of their ethnicity. We are Gweno and they [the attackers] are Panduru. They should restrict themselves to their place,” she said, adding that the police had not come to their rescue, only showing up the next day to find that people had fled the village. Since then, she added, some residents had returned to rebuild their houses. Uyera’s family, however, is still seeking refuge among the banana plants in the field. She urged the Congolese government to provide shelter and education materials for the children to enable them to resume schooling. An inadequate police presence and a weak justice system are part of the problem, according to public officials in Mahagi. “You will find one police officer for two villages, without equipment or a means of travel. They are also high on cannabis and alcohol. Or you will find five police officers for a whole chiefdom,” said Joel Batena, the president of the Mahagi Court. 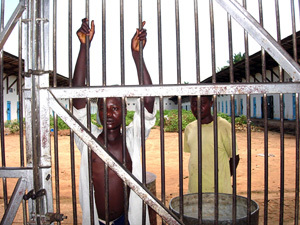 Those who are arrested, prosecuted and detained end up at the central prison which is very old and in a state of disrepair. It is also guarded by just two police officers, making prisoner escapes easy. Prisoners there are not fed, added Batena. Some detained perpetrators of mob violence also escape or are released on bail. “These criminals become very dangerous to the population,” said Jean Bosco Ngamubieme, the Mahagi Territory administrator, adding that they sometimes end up being killed in repeat mob attacks due to the danger they are seen as posing. According to the head of police training in the DRC, Gen Juvenal Bideko, some 500 new police officers are to be deployed to Orientale Province. “Admittedly, this is far from satisfactory. We are also looking to involve other sponsors in the training and equipping of another 1,000 police officers,” he said. Through its justice support programme in eastern DRC, the European Union has provided 1.2 million euros (US$1.65 million) towards supporting judicial infrastructure in the provinces of North and South Kivu as well as in the district of Ituri. The funds are designed to help build the capacity of judicial personnel, improve access to justice for all litigants especially the poor, improve prison conditions and boost the fight against impunity for serious crimes, Hubert Nzakumuena, the head of the programme, told judicial staff in Bunia recently. Head of the Angal chiefdom Serzh Jalaure urged the DRC government to set up local courts to bring formal justice closer to the people. He also proposed that the government allow local arbitration mechanisms to deal with petty crime. 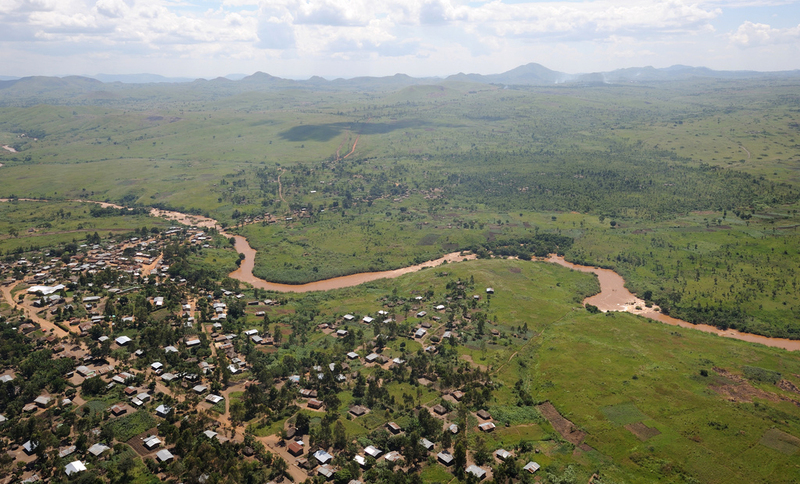 Angal is the worst affected of the eight chiefdoms in Mahagi Territory by acts of mob violence. “The people are forced, even for small problems, to go to the magistrate’s court which is far away from here, and cases often drag on. Consequently, the people prefer to resolve their problems themselves,” said Jalaure. Il y aurait 54 groupes armés en fuite dans l’est de la République démocratique du Congo (RDC), selon les estimations du gouvernement, qui prévoit de consacrer les cinq prochaines années à les éradiquer.